800 is a magical number when it comes to the NPTE. It’s the highest score reported: maybe not a “perfect” score, but the highest possible based on the NPTE’s scoring system. 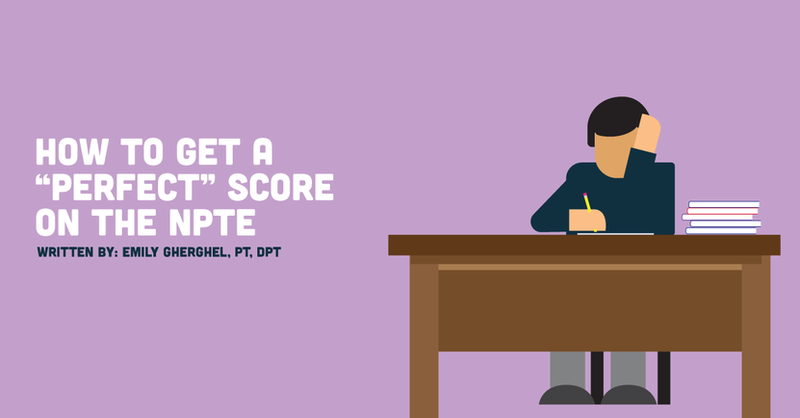 The NPTE is scored in a way that takes your raw score, which is the number of questions answered correctly, and converts it to a scaled score. The FSBPT does this to ensure fairness in scoring as each exam is slightly varied in difficulty. An 800 score is not necessarily perfect in the sense that you didn’t miss a single question, but it does mean that when your raw score was converted it was scaled to 100%. When you receive your individual score report there will be a number score out of 800, as well as a converted score in a percentage. There were 3 factors that directly contributed to my ability to score 800 on the NPTE — so let’s get to it. I started with the PEAT practice form about eight weeks before the exam without reviewing a single concept because I needed to gauge my baseline. Everyone needs a baseline and the PEAT practice form is the perfect way to establish it. Two weeks later, after only studying the bulk of NPTE content (musculoskeletal), I took the PEAT retired form. I will tell you I didn’t score particularly well on either of these: in fact, I only passed by about 6 and 14 questions respectively. You may not score well on the PEAT either and it may scare you! You will hear that it’s the best indicator of your ability to pass and while it’s important to treat it as the real thing, do not become discouraged if your score isn’t where you want it to be. Over the next 6 weeks I pored through my review books and notes. I took 1 exam per week: 3 from Scorebuilders and 3 from Therapy Ed. You will feel exhausted during every single one of those tests and you may not fully focus throughout. You may not be receiving the score you want (I didn’t pass a single one) but KEEP taking them. The exposure to that many test questions/content and the mental fatigue you learn to endure will lead you to success on the real deal. This is huge and not something many people consider. You will come across topics and words you’ve never seen before on the NPTE — it’s inevitable. This is when you need to remember prefixes and common roots of medical terms. Maybe Latin isn’t so useless of a language to learn after all? When you come across a word you don’t recognize, DON’T PANIC. You know everything you need to be able to figure any question out — don’t downplay your guesses. Those are some extremely well educated guesses, and you know the answer! This is key. Spend the entire 24 hours before the exam doing anything but studying. Go to the gym, play video games, download new music, watch a movie, read fiction. DO NOT study. Give your brain a break from the months of studying that have just occurred: whatever you look at in the 24 hours before the test certainly isn’t going to make or break you. There you have it! No big, juicy secrets and no bizarre tactics to scoring an 800 on the NPTE. Trust your instincts and your education. Hopefully, the combination of those things and these tips will help you achieve your very best score! Good luck and happy studying.